غفوریان, حسین, خدادادحسینی, انسیه, ربانی, محمد. (1394). نانوجاذب جدید GH-92 با استفاده از اسفنج‌های خلیج فارس برای جداسازی سرب و کادمیم. مجله آب و فاضلاب, 26(2), 2-12. حسین غفوریان; انسیه خدادادحسینی; محمد ربانی. "نانوجاذب جدید GH-92 با استفاده از اسفنج‌های خلیج فارس برای جداسازی سرب و کادمیم". مجله آب و فاضلاب, 26, 2, 1394, 2-12. غفوریان, حسین, خدادادحسینی, انسیه, ربانی, محمد. (1394). 'نانوجاذب جدید GH-92 با استفاده از اسفنج‌های خلیج فارس برای جداسازی سرب و کادمیم', مجله آب و فاضلاب, 26(2), pp. 2-12. غفوریان, حسین, خدادادحسینی, انسیه, ربانی, محمد. نانوجاذب جدید GH-92 با استفاده از اسفنج‌های خلیج فارس برای جداسازی سرب و کادمیم. 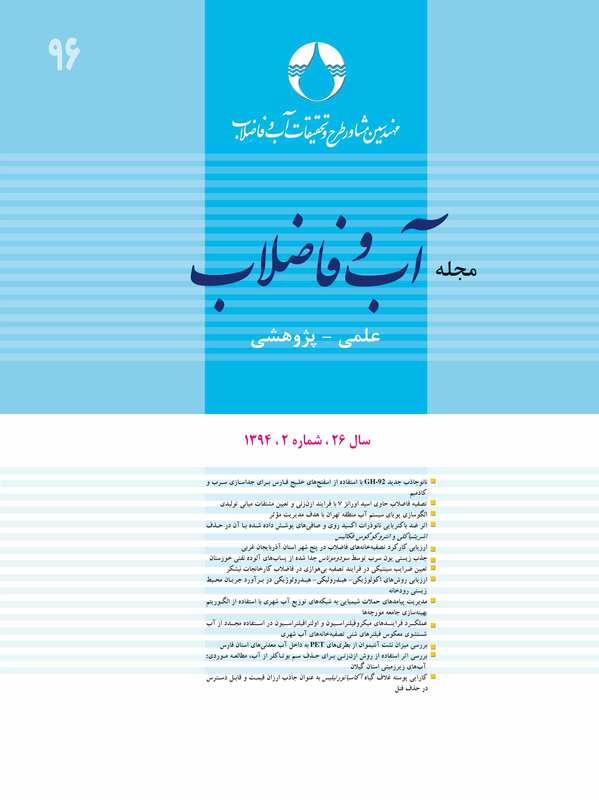 مجله آب و فاضلاب, 1394; 26(2): 2-12. حذف آلاینده‌ها در اکوسیستم‌های آبی به‌ویژه آب‌های آشامیدنی، همواره مورد نظر پژوهشگران بوده است. در دهه‌های اخیر، از ترکیبات طبیعی به‌عنوان جاذب در حذف آلاینده‌ها به‌فراوانی استفاده شده است. پژوهش‌های مختلف انجام گرفته در دنیا، نشان داده است که یکی از روش‌های مؤثر در زمینه حذف آلاینده‌ها، فناوری نانو است. در این پژوهش، برای اولین بار در دنیا از یک گونه از اسفنج‌های بومی خلیج فارس متعلق به رده دموسپونژیا که دارای حفره‌های نانو است برای حذف یون‌های کلسیم، منیزیم، کبالت، کادمیم و سرب از آب استفاده شد. میزان جذب در دانه‌بندی‌های مختلف اسفنج، زمان تماس و میزان pH بررسی شد. نتایج نشان داد که این نوع اسفنج قادر است مقادیر مختلفی از یون‌های یاد شده را جذب نماید. میزان جذب یون‌های کلسیم، منیزیم و کبالت توسط این نوع اسفنج بسیار ناچیز بود و بیشترین ظرفیت جذب مربوط به یون کادمیم در محدوده pH برابر 5 و غلظت 5 میلی‌گرم در لیتر، برابر 37/2 میلی‌گرم بر گرم و یون سرب در محدوده pH برابر 5/4 تا 5 و غلظت 300 میلی‌گرم در لیترو اندازه ذرات با دانه‌بندی230 مش با ظرفیت جذب 19/79 میلی‌گرم، به‌ازای هر گرم جاذب به‌دست آمد. Removing pollutants from aquatic ecosystems, especially from drinking water, has always been a major concern for scientists. Recent decades have witnessed the widespread application of natural compounds used as adsorbents to remove various pollutants. On the other hand, studies have proved nanotechnology to be an effective way of removing pollutants. A new type of sponge belonging to the family Demospongiae that has nano holes and is native to the Persian Gulf was investigated for the first time in the present study for use as an adsorbent to remove calcium, magnesium, cobalt, cadmium, and lead ions from water. For this purpose, adbsorption in sponges of different aggregate sizes, contact time, particle size, and ambient pH were measured. The results showed that the proposed sponge is capable of adsorbing the above-mentioned metal ions to various degrees. While small amounts of calcium, magnesium, and cobalt were adsorbed by this sponge, cadmium recorded a higher adsorption of 2.37 mg/g at pH=5. The highest adsorption level of 79.19 mg per gram of adsorbent was recorded for lead at a pH range of 4.5-5 with a mesh size of 230. This is the highest adsorption ever recorded for lead in the literature on selective separation of lead from the other ions. J. of Environ. Qual., 10(2), 188-193. Cesar, R.T.T., Sergio, L.C.F., and Marco, A.Z. (2004). “Use of modified rice husks as a natural solid adsorbent of trace metals: Characterization and development of an on-line pre concentration system for cadmium and lead determination by FAAS.” J. of Micro. Chem., 77, 163-175. Bhattacharya, A.K., Naiya, T.K., Mandel, S.N., and Das, S.K. (2008). “Adsorption, kinetics and equilibrium studies on removal of Cr (VI) from aqueous solutions using different low-cost adsorbents.” J. of Chem. Eng., 137, (3), 529-541. Cay, S., Uyanik, A., and Ozasik, A. (2004). “Single and binary component adsorption of copper from aqueous solution using tea- industry waste.” J. of Sep. Purif. Technol., 38(3), 237-280. Namasivaym, C., Kumar, M.D., and Begum, R.A. (2001). “Waste coir pith-a potential biomass for the treatment of dyeing wastewaters.” J. of Biomass Bioenerg, 21(6), 477-483. Annadurai, G., Juang, R.S., and Lee, D.J. (2002). “Use of cellulose-based wastes for adsorption of dyes from aqueous solutions.” J. of Hazard Matar., 92(3), 263-274. Batzia , F.A. (2004). “Dye adsorption by calcium-chloride treated beech sawdust in batch and fixed- bed system.” J. of Water Res., 38(13), 2967-2972. Ozacar, M., Sidiras, D.K., and Sengil, I.A. (2005). “Adsorption of metal complex dyes from aqueous solutions by pine sawdust.” J. of Bioresour. Technol., 96(7), 791-795. Bhimba, V., Vinod, V., and Beulah, C. (2013). “Marine sponge sigmadocia pumila a potential supply for drug findings.” J. of Pharmacy Research, 6(4), 401-403. Senthilkumar, K., Venkatesan, J., Manivasagan, P., and Se-Kwon, K. (2013). “Antiangiogenic effects of marine sponge derived compounds on cancer.” J. of Environmental Toxicology and Pharmacology, 36(3), 1097-1108. Batista, D., Tellini, K., Nudi, A.H., Massone, T.P., de, L., Scofield, A., de, L.R., and Wagener, A. (2013). “Marine sponges as bioindicators of oil and combustion derived PAH in coastal waters.” J. of Marine Environmental Research, 92, 224-234. Kotpal, R.L. (1998). Porifeva, Rastogi Pub. Meerut, India. Buasri, A., Chaiyut, N., Phattarasirichot, K., Yongbut, Ph., and Nammueng, L. (2008). “Use of natural clinoptilolite for the removal of lead (II) from wastewater in batch experiment.” J. of Chiang mai., 35(3), 447-456.